COLOURS OF THE SUN - slow textiles experience 3-12 MARCH 2019 FULLY BOOKED. Next retreat is being held September 2019 contact Aviva to register your interest. Join Aviva for a unique city (Marrakech) , coast (ESSAOUIRA) and countryside (ARGAN FARM at Tidzi) textiles experience. Aviva has been travelling to Morocco since 2007 and would love to share her passion for this wonderful place with you. As the direct flights to Essaouira are no longer operating, we will be flying in and out of Marrakech from Stansted. NATURAL DYE WORKSHOP 2 - DYEING AND PAINTING WITH LOCAL COLOUR ON YARN AND CLOTH (MADDER, POMEGRANATE, HENNA, CAMOMILE) using locally sourced ingredients and wool to create a palette of colour for your textiles projects. NATURAL DYE WORKSHOP 3 - PREPARING AND USING AN INDIGO VAT. Get secondary shades by over dying the primary colours from yesterday and learn how to create resist patterns inspired by traditional Berber and North African textiles. TRANSFER TO ESSAOUIRA TO DAR BO, (30 minutes) our stylish riad in the medina with a roof terrace and sea views. Sunset beach walk with a cocktail and snack supper at a friendly beach bar. EXPLORE ESSAOUIRA Start with a morning walk around the medina, discovering this atmospheric and friendly city by the sea. Aviva will introduce you to some of her favourite local artisans, weavers, woodworkers and carpet sellers and take you to her special spice shop to buy delicious things to take home with you. In the afternoon we’ll have a relaxing afternoon back at the riad where you will take part in a slow stitch or weave workshop. We will enjoy dinner in a local restaurant with music. A day at leisure to enjoy all that Essaouira has to offer. Stroll through the winding streets, visit art galleries and soak up the atmosphere. Enjoy fresh fish from the local grill restaurants. Optional Hamman experience - enjoy a pamper session at an exclusive spa or Optional Day excursion with coastal walk to waterfall and lunch with local Berber family. Relax on the terrace back at the riad and continue to work on your slow stitch or weave project. Enjoy sunset cocktails or dinner at a local rooftop restaurant. TRANSFER TO MARRAKECH via Had Draa, an authentic country souk on the road to Marrakech - farmers of the region travel there by donkey to offer their crops, animals and crafts and to shop for the week. We arrive in Marrakech in the early afternoon and after settling in at our gorgeous riad. We will visit a local women’s social enterprise that create beautiful embroidered textiles then take a stroll down to the Jmaa El Fna to experience the energy of this famous square. Dinner in the riad or at a local restaurant. EXPLORE MARRAKECH According to the Koran, the garden is a metaphor of heaven. We visit two different gardens to escape the hustle and bustle of the city. Morning visit to Yves St Laurent’s Jardin Majorelle and Le Jardin Secret, a restored 19th century palace and gardens where we will enjoy lunch. Afternoon walking tour with a private guide around the old city of Marrakech, with a visit to a palace, the dyers souk and the tanneries. For our last evening in Morocco we will enjoy a short concert of traditional music followed by a delicious dinner at a local restaurant. 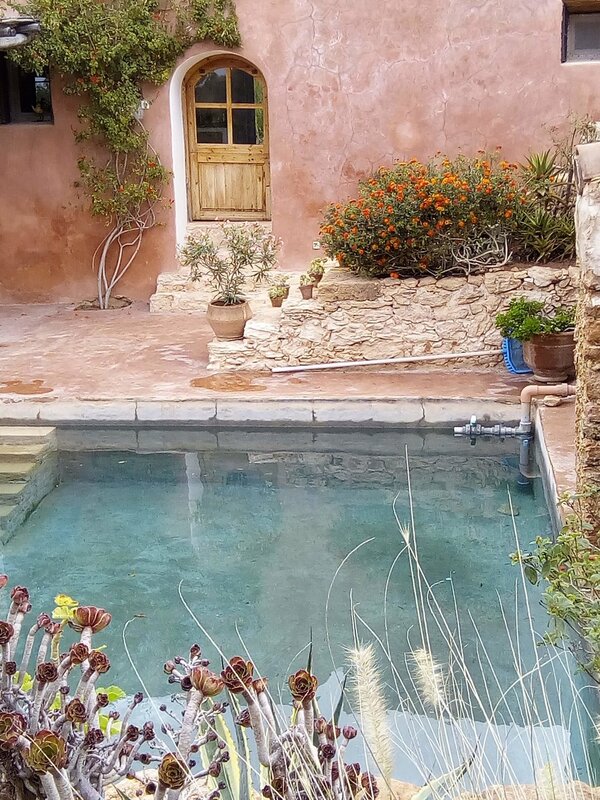 I am writing to say what a fantastic holiday I have had in Morocco; it was a wonderful mix of workshops and experiences in Essaouira which was quite magical - food and accommodation was first class, and the guidance to shops and bars a real treat! ...as for the workshops, extremely informative and enjoyable; I really learnt a lot. the visit to the countryside was also interesting, especially with Claudia guiding us.